Two stage telescopic jack units (TJR series) consist of upper and lower pistons, a cylinder, and a head bearing and packing gland for each piston. The lower piston is fitted with an additional packing gland at the lower end which rides against the internally honed cylinder. Three stage telescopic jack units (TJ3 series) consist of upper, intermediate, and lower pistons, a cylinder, and a head bearing and packing gland for each piston. The intermediate and lower pistons are fitted with additional packing glands at their lower ends which ride against the internally honed cylinder and lower piston. All telescopic jacks have a synchronous design where all pistons raise and lower at the same speed and at the same time. Telescopic jacks are designed for “guided” applications only, where the Jack unit is rigidly supported and guided through the use of guide rails and guide shoes. 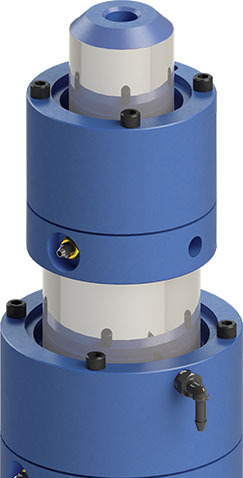 In some applications a piston follower guide may be required on all moving heads to meet code requirements. (Contact EECO). Two stage telescopic jacks are designed for in-ground and holeless cantilever or dual system applications. Three stage telescopic jacks are designed for only holeless, cantilever, or dual system applications. Two stage telescopic jacks are available from 1.6” to 4.5” (41 to 114 mm) upper piston diameter, in a wide range of wall thicknesses. Three stage telescopic jacks are available from 1.6” to 2.5” (41 to 64 mm) upper piston diameter. TJR & TJ3 series: 1200 psi (82.7 bar) maximum working pressure.